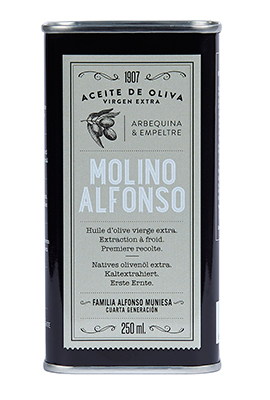 With the freshness of the first olives and a careful harvest, we get a balanced oil thanks to the excellent quality of the fruit and the rigorous process of cold extraction, minimizing the time between harvesting and grinding. Cold extraction. Available in 250 ml. tin. With aromas of tomato and fresh cut grass. Green in colour. It is ideal for vegetables and salads. Available in 250 ml. tin. With almond and apple sensations. Yellow. Perfect for fish, sauces and stews. 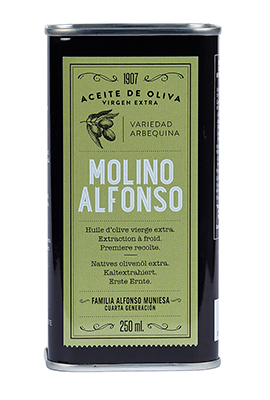 Balance of the two varieties, providing stability, smoothness and freshness to dishes. ALFONSO MUNIESA. All rights reserved.